Warner Heating & Air provides central air conditioning services, new ac installs, repair and service maintenance. We are an owner-operated cooling and heating company with over 23 years experience in central air conditioning and furnace services based in Riverton, Utah. 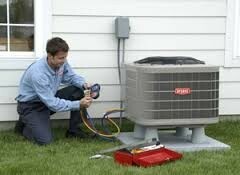 If you are looking for a quality air conditioner service, repair and sales company, we are here for you. We will never pressure you to buy or perform any service or repair. Our A+ rating with the Better Business Bureau shows we are dedicated to ensuring you are dealing with a reliable, professional and trustworthy company. One advantage is we are a Bryant Authorized Dealer allowing us to alert you of any financing options, rebates or special offers currently available. Need a New Central Air Unit? What Brand of Air Conditioner Should I Purchase? 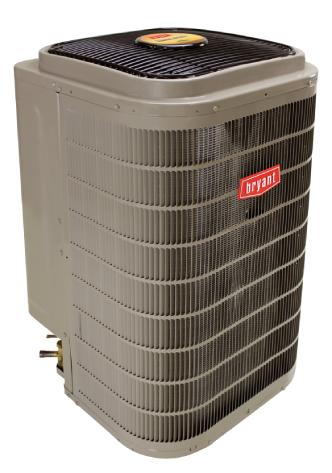 We always recommend Bryant air conditioners. They have a great track record and we’ve rarely had to go back to take care of a warranty – they are that good. Why is Bryant so good? To get technical for just a minute, a very crucial part of the A/C unit is called the “filter dryer”. With Bryant, the filter dryer is installed by the technician onsite and not by the factory. This makes it so the install can be personalized to your home’s situation for longer life. Here’s a quick technical description of how it works. The new refrigerant (R410A) absorbs a lot of water which can shorten the life of the compressor and unit. Since we can customize how the filter dryer is installed, we can do it so it keeps your unit dry and prolongs its life. How Long Will My Central Air Unit Last?…and How can I Prolong the Life of My Air Conditioner? Central Air units generally last about 15-20 years depending on the maintenance. One thing that most people don’t realize is that changing the furnace filters frequently will prolong the life of an A/C unit. Also, to help prolong the life of your Air Conditioner, check your outdoor A/C coil yearly and clean it off with a hose. This helps clean out the dirt and cottonwood so prominent in our area here in Utah. For proper cleaning have a professional wash from the inside out. R410A / Puron replaces the current R22 refrigerant which the US Environmental Protection Agency has mandated to cease production by 2020. Between now and then, production of R22 will be scaled back. As that happens, the cost of R22 will skyrocket in price (supply and demand for all you economics majors). Bryant has been using the new refrigerant (R410A) longer than any other company, so they’ve had time to work out all of the bugs. We highly recommend you get an R410A unit for a new A/C install, because soon R22 will become obsolete. The R410A units cost a little more now, but considering the rising cost in R22, it will save you money in the long run. Will I Need to Pour a Pad? Pouring a pad for your air conditioning unit is a personal choice. We can place a hardened plastic equipment pad that is made for your A/C unit and is included in the cost of the air conditioner. However, if you like the look of cement better, or if you may pour a patio in the future, you may want to pour a cement pad. If you decide you need a cement pad, you will have to contact someone to pour the pad for you. For all your Central Air Needs, Call us at 801-254-6433 for a FREE estimate. You can also find out about our quality home air purifiers! It’s getting colder. Learn how to get your furnace ready for the winter months.